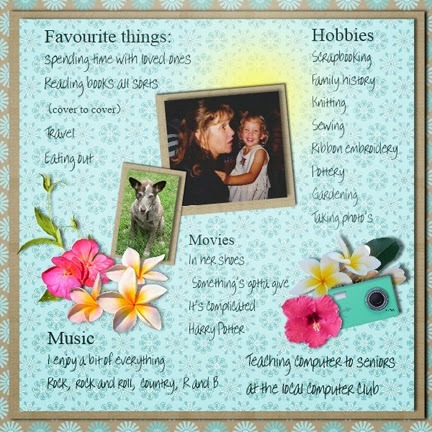 MyMemories Blog: Today's Daily Designer....Carolyn's Scrap Creations! Today's Daily Designer....Carolyn's Scrap Creations! Hi my name is Carolyn, or Carol. I live in Sunny Qld Australia. My mum introduced me to crafts when I was little, I remember sitting at the kitchen table, making all sorts of crafty items. I think I have tried just about every craft going, attending small markets with friends, selling knitted jumpers, ribbon embroidered dresses, pottery animals and assorted crafts. My Mum owned a pottery shop for about 10 years, where I worked part time, making handmade pottery animals and helping her glaze and stack the kiln. I got involved with scrapbooking in 2008, after my Aunt created an Album for my Dad. I decided I wanted to scrap the family history and create a baby album for my daughter. While I was searching online, looking for items to print out for these albums, I found digital, scrapping. I love the no mess scrapping, with items that are re- usable, making it much less expensive than paper scrapbooking, I was hooked. But I still have a messy craft room where I occasionally play with paper. I became a Creative Team member, for a number of designers and I really enjoyed the challenge of working with the different styles of kits, if I had to describe my scrapping style, I would say I it is eclectic. I started out making some free to use, scrapbooking kits, which are available on my Web site, which progressed into designing and selling scrapbooking kits, I enjoy putting together kits for you to use. Enjoy 40% off Carolyn's Scrap Creations in the MyMemories Design Shop!